As your child’s very first dance lesson approaches, he or she is in for a fun, exciting time at the Arthur Murray Lincolnshire Dance Center. With highly trained and experienced instructors leading the way, your child will discover all the wonders of social dance. Over the course of the coming weeks, you’ll have a first-row seat as you watch their talent develop and their personality bloom. Here’s what you can expect from the first day in the Arthur Murray ballroom. Your child will start dancing right away. The first few lessons will be dedicated to teaching some of the basic moves to help get them warmed up and acclimated to the studio. The children will work on rhythm, timing, foot position and leading/following techniques, and eventually, they’ll move on to more complicated patterns. 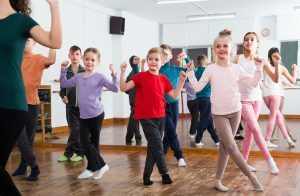 To make sure each class feels fun and exciting, our kids’ program infuses a variety of dance styles into the curriculum. Kids get the opportunity to try new things as they learn the fundamentals, letting them travel the world through dance. And don’t worry, we understand every child learns at a different pace and not everyone will be interested in the same styles. That’s why our instructors incorporate a variety of dances into the mix to give every dancer an enjoyable experience. Even though dance lessons for kids will be focused on learning the steps, students will learn much more. From the first lesson, your child will get a glimpse into the welcoming, friendly atmosphere of our studio. With patience and support, we hope to instill values of self-discipline, accountability, creativity, social graces and self-expression into the dancers. And, of course, your child won’t be expected to master all the moves on the first day, so it’s easy to build confidence over time. If you have questions about children’s dance lessons at Arthur Murray Lincolnshire, call us at 847-821-9321 or contact us online. We’ll make sure you have all the information needed for a successful first lesson that fosters a lifelong love of dancing. © 2019, Arthur Murray Lincolnshire Dance Center. All Rights Reserved.